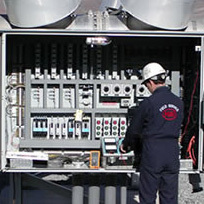 Equipped with the latest, state of the art test equipment, our technicians and engineers are able to test and calibrate the most sophisticated electrical distribution system in service today. Acceptance testing and start-up services provide customers with the assurance that their equipment complies with the specifications and establishes a base line for future reference. Experienced engineers and technicians utilizing the latest state-of-the-art test equipment can assure our customers a timely start-up for their plants.